Aggregate of two tabular crystals. 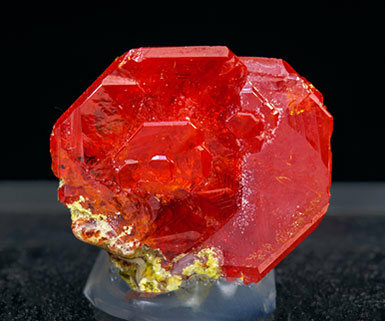 They are translucent, very bright, have an extraordinarily vivid and intense red color and are on a small matrix. Very aerial aggregate, with a small matrix, of very sharp platy crystals, one of them clearly dominant. 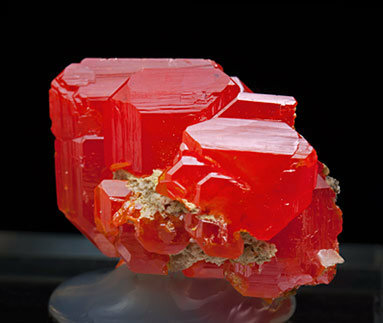 They are translucent, very bright and have an extraordinarily vivid and intense red color. 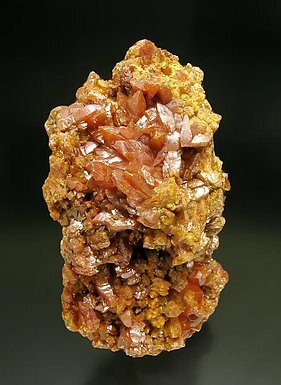 Very aerial aggregate, on matrix, of very sharp platy crystals, translucent, very bright and have an extraordinarily vivid and intense red color. A novelty at Munich 2015. Aggregate of very sharp and aerial tabular crystals. 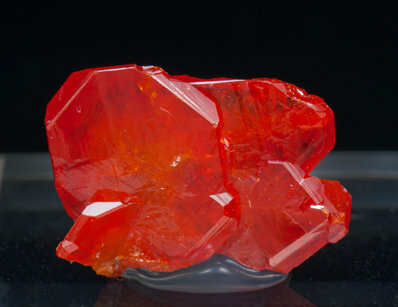 They are translucent, very bright and have an extraordinarily vivid and intense red color. 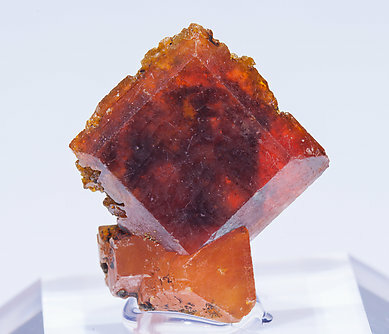 Aggregate of very sharp platy crystals, translucent, very bright and have an extraordinarily vivid and intense red color. 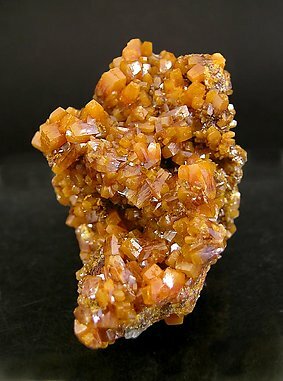 Floater group with two complete and very sharp Wulfenite crystals that are translucent, with inclusions, and with a very intense orange color. An excellent miniature from a locality considered as a classic for the species. Group of very sharp crystals, one of them clearly dominant, with polycrystalline growths and dominant pyramidal faces. They are translucent, bright and with a very deep orange color. 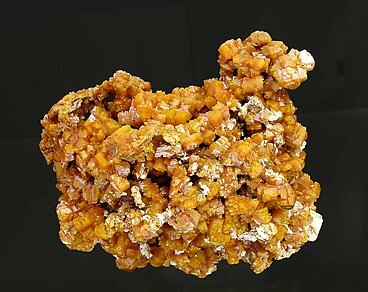 The sample is from a locality that is a classic for Wulfenite but where good samples are very scarce. 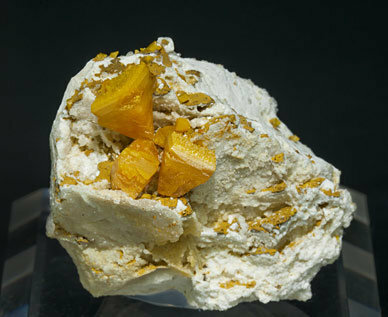 Isolated and grouped tabular Wulfenite crystals on matrix. They are translucent and bright with a good reddish orange color. An American classic. 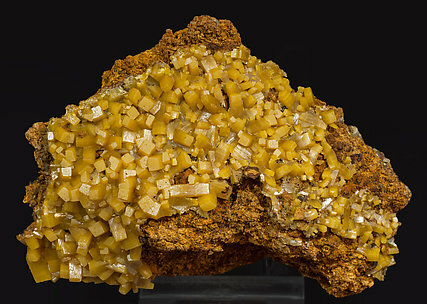 Druse of prismatic Wulfenite crystals formed by a single prism and the flat terminal pinacoid on a matrix of limonite. They have an excellent color and good luster. 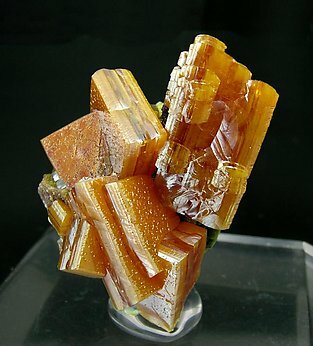 Group of thick tabular crystals that have simple crystalline forms with very well defined faces and edges and with a color and luster among the best known for the locality. 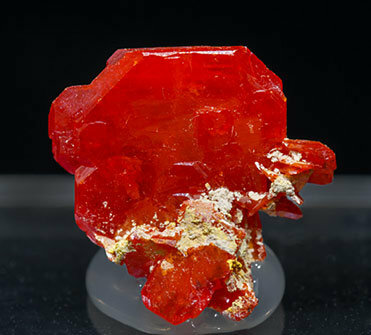 Isolated Wulfenite crystals on matrix, one of them clearly dominant, with a shape and color (intense red) very different than usual for the locality. 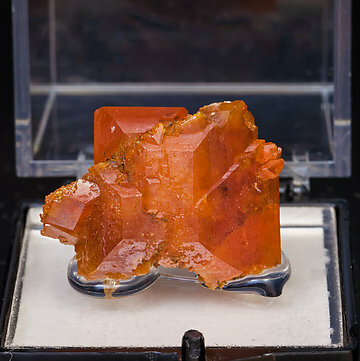 The crystals, small, are laminar and have very well defined faces and edges and octagonal outlines. 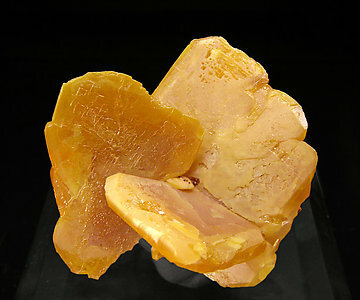 Their luster and intense yellow color are excellent and some of them have transparent edges. 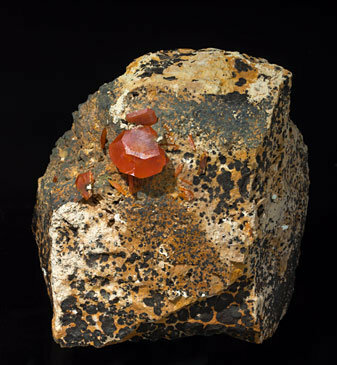 Irregular aggregate very rich with crystals that have between a laminar and tabular shape and an orange color, not too common at Bleiberg, the type locality for the species. An European classic. Group of laminar crystals with pyramidal faces, yellow with color zoning. We specially note the locality, an European classic for the species. 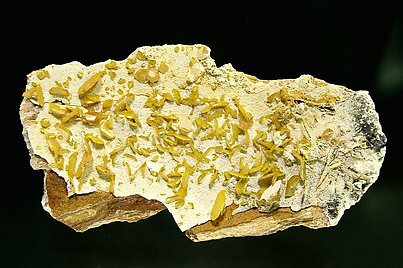 From the legendary locality of Miess (now called Mezica) comes this group of bi-pyramidal crystals, a form that is not common in Wulfenite. The tips of the crystals are complex and they separate into numerous pyramids. The color is excellent. This one comes with A. Berger, Vienna and D. E. Boydston labels. 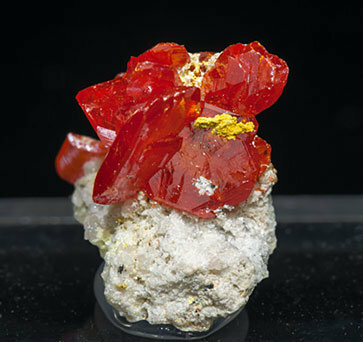 A specimen from one of the best and most classic localities for Wulfenite. 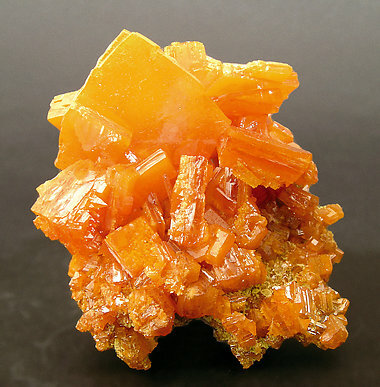 Numerous dipyramidal and deep orange doubly terminated crystals, with parallel growths. 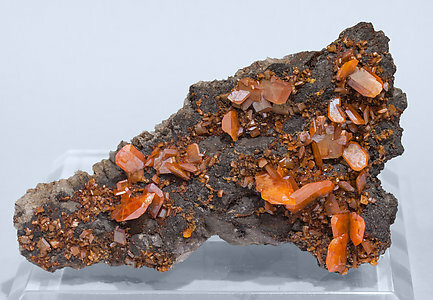 The specimen is from a German collection and under the label we found an older label from the Freiberg School of Mines. 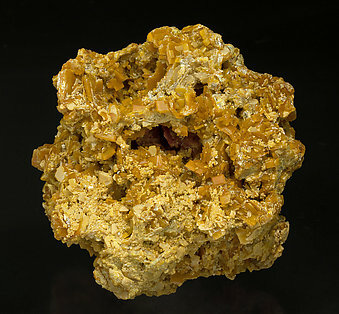 Aggregate of crystals of a considerable size for the locality and with very well defined faces and edges. They are translucent and have a yellow color with orange shades. 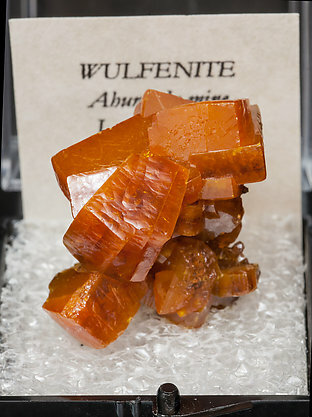 It is from a very well known locality but which very few Wulfenite samples of good quality are preserved. 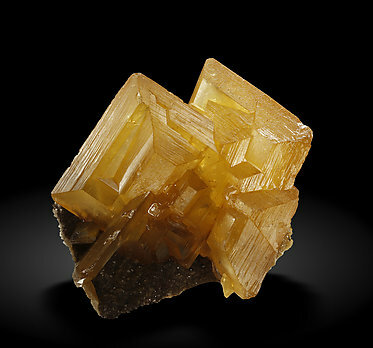 Group of crystals, on matrix, with a clearly hemihedral shape, in which one of the terminations is very acute, being smooth and finely polycrystalline unlike the opposite. An excellent classic, very characteristic for the locality, showing a very original crystal shape. 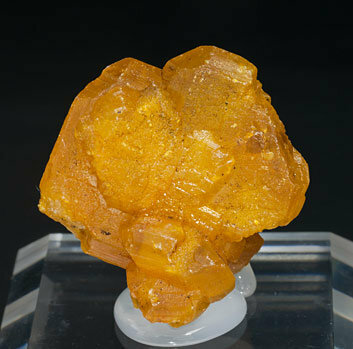 Thick tabular crystal group, perfectly defined, very bright, with the best color known for this locality. 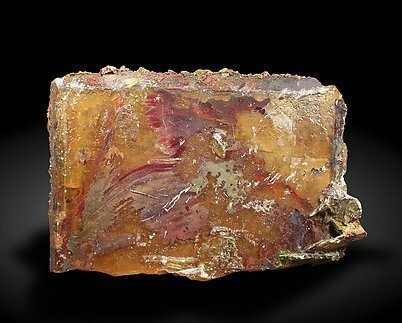 Crystals are positioned on a small matrix of Limonite with a very aerial shape. Good color and shape, damage free, floater. Good combination for this oldie. 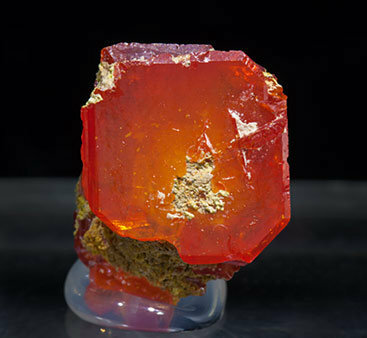 The crystals, with perfect color and brilliance, have a elongated form that is not common among examples from Los Lamentos. 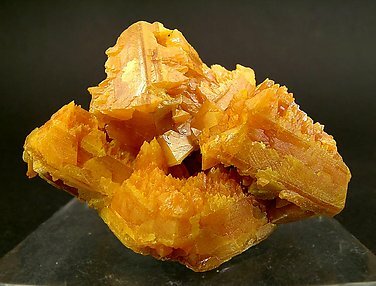 Group of bipyramidal acute crystals, much of them doubly terminated, very well defined and with intense deep orange color. Although the locality on original the label is Tiger, we authenticated the specimen as coming from Los Lamentos, so we give this last locality as correct. We will send the label of the sample, from the Ernest Windisch collection (World Wide Minerals), Philipsburg, Québec, to the buyer.